I think most would agree that this time of year, even more so than the rest, is chock full of various concerts, special programmes and other music-related performances, spontaneous and otherwise. It beggars belief to imagine a music-less holiday season, whether you’re remembering the Maccabean revolt in Jerusalem, commemorating the birth of Jesus Christ, celebrating African heritage and culture or something else entirely. Music is, of course, a constant presence in the daily lives of most of us – in fact, whether we want it to be or not. That subject itself deserves a lengthy discussion that I however won’t indulge in right now. This time I’d like to indulge in a little shameless self-promotion, directed especially to those of you who live in or close by either Härnösand or Jönköping in Sweden as you have upcoming opportunities to hear me and my music performed live! 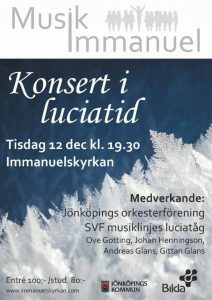 Opening a traditional Lucia and Advent concert in the Immanuel Church in Jönköping is an orchestral piece I wrote earlier this season, Marche funèbre, as a companion piece to Mozart’s Requiem. While it is intended to be a pendant piece, a sort of prologue even, to Mozart’s famous death mass, it’s a complete work in itself that will be premiered at this concert by Jönköping Orchestra Society (in Swedish). Read more about the concert here. Den heliga natten, the holy night, refers to the night when Jesus Christ was born into the world, a night which is remembered in the entire Christian world in December every year. Many composers have written musical works, such as Christmas oratorios, celebrating this event. One such composer is Hilding Rosenberg, a renowned Swedish 20th century composer and conductor. His Christmas oratorio, called simply The Holy Night, features a chamber orchestra and choir as well as soloists and a narrator. In this performance I will be performing as both one of the soloists as well as the narrator, which I look forward to tremendously. The concert will also feature an a cappella choral piece of mine, a setting of the French ‘Our Father’ prayer, Notre Père. Read more about the concert here. ⟵Mahler’s 5th symphony – live!